Welcome to the newly designed WilsonAuctioneers.com. 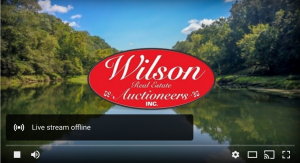 The goal of the new site is to put a focus on the types of properties Wilson can handle, and the commitment we take with every auction we handle. Part of the new site is a heavy focus on delivering more value through content, which includes putting you at the Auctions live! Visit our live Youtube channel and follow along as we sell property! Hot Springs-based Wilson Real Estate Auctioneers Inc. announced Monday (July 17) the hiring of Chuck Dicus as a real estate sales agent. Dicus, who played football at the University of Arkansas, is a former president of two notable nonprofits in the state — the Razorback Foundation and the Arkansas Game & Fish Foundation. He also previously worked for commercial real estate firm Irwin Partners in Little Rock. Dicus will be responsible for listing real estate, farms and commercial properties for auction in Arkansas, with a focus on Northwest Arkansas. Wilson also announced Ken Bethge has joined the firm as executive broker and closing coordinator. Bethge recently retired as senior vice president of Jefferson Title Co. in Pine Bluff. “Ken’s experience in the title insurance business will further our commitment to providing clear transactions, 30-day closings and a direct line for our buyers and sellers to receive information for their closings,” Wilson said in the release. Bethge, who has 45 years of experience in the real estate business, has served as secretary of the Arkansas Building Authority Council, chairman of the Jefferson County Equalization Board and chairman of the Pine Bluff Planning Commission.